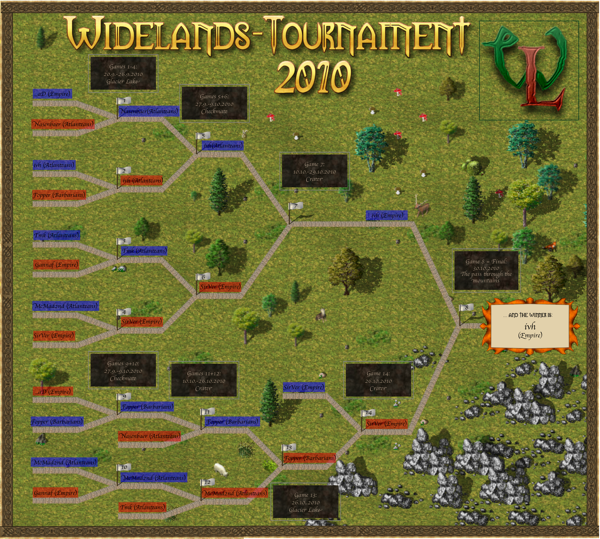 We are proud to present the first Widelands tournament ever : it will take place 20th September till the end of October. A highly detailed strategy game with plenty of different playing opportunities, many cute animations, graphics and sounds, translated (> 50% of all texts) in 18 languages, including 3 tribes, 4 worlds, an editor, (in near future: several win conditions), a lot of maps and the possibility to play against the computer or other players. So lets celebrate this success of so many engaged graphic designers, translators, map creators and programmers! Its open for everyone: Developers, Casual Gamers, Fans, Followers. Everyone. Playing together is possible via internet or local network. The final game takes place the week-end of the WihackTwentyTenReloaded (30th october), but you dont have to be present there to win :-). As we want to play a double elimination tournament, the number of participants has to be a power of 2, so the first 2/4/8/16/32... registering players will be in. How big the tournament will be is determined by the number of players who sign up. To have the chance to get a unique WL-Winner-T-Shirt. until 19th September 2010 (thats soon, but otherwise we can't do all games until the WihackTwentyTenReloaded). The brackets (who is playing who) will be presented here after the end of the registration period. 1 vs. 1, Player combinations will be drawn randomly and presented here. If there are many registrations, this mode may be preceded by a group stage. Games are hosted by one of the two players or another person. Due to a bug in build 15 for Windows, a Windows player cannot host games. To find someone, who hosts a game for 2 Windows players, ask in the IRC chat. indication which tribe he plays in the next game. Playing which tribe? Your favorite! When you register, include which tribe you want to play in your first match. After the game, let Kristin know which tribe you want to play in your next match. So its determined, but secret until the start of the next game. Playing which map? For each game, there is a predetermined map. For the first game, its Glacier Lake. There will be 2 - 8 games per person. For every game, the players will have approx. one week. Exceptions is Final which should take place 31st of October. A replay consists of two files (a .wgf and a .wrpl); both must be sent in. Widelands saves those files into its replays directory automatically. You have to send both files via Mail to Kristin. Also include the version of widelands you played (the information in the bottom right corner in the main menu of widelands) as Kristin needs to use precisely this version to check the files. Game 12: McMad2nd VS Tmk: unfortunately, the game didn't take place and Tmk has surrendered. Make sure to have the same game version (shown in brackets) as the replay to watch them. As there are 8 participants now, and I consider it quite improbable (although not impossible) that there are 8 more registering today, I publish the player's combinations right now. You find the bracket here. You see that it's a double elimination as announced, so even after one lost the first game, he gets another chance in the looser's bracket and may be the winner in the end. If you play a developer's snapshot please choose the win condition "endless game". The game ends when one player gives up. The replays of the games will be uploaded and links will be posted on this page so that others can watch the games and players may have the chance to learn from their own and other replays. Be sure to make autosaves (e.g. all 5 min) while playing. So you may return to the last autosave in case of desyncs. There may be a problem with scouts, but that's only speculation. Another important thing: the two players have to use the same version of the game. I wish you good luck and a lot of fun in playing Widelands! As game 12 cannot take place in the predicted time interval, it will be played on 24th october. This is in consensus with all affected players. Only 4 games to be played before the final! The first Widelands tournament has just been finished by an exciting game between ivh and SirVer, both playing empire. And ivh is the winner! Congratulations!